‘I, Robot’ succeeds where other recent sci-fi blockbusters fail. By framing the plot in terms of ‘laws’, rather than clunky thought-experiments (the Matrix) or a sickly emotion vs. reason dualism (AI), ‘I, Robot’ carries out a thoroughly rigorous exploration of the potentialities of robots within a set of limited parameters. It is all the more successful for it. Set in the bustling, comsmopolitan, chromium Chicago of 2035, where robots and humans mingle together in a vision that owes much to Blade Runner in its sheer variety (lots of 'kyber-punks' etc. wandering around), the ‘three laws’* have seemingly held the socius together for quite some time: the robots apologise if you knock into them, are nice when you are rude, fetch things for you at top speed if you need them, and so on. For reasons that are later revealed, only one non-robot mistrusts his seemingly innocuous mechanical comrades – maverick Detective Spooner, played by Will Smith - you can tell he’s a maverick because he wears antique Converse trainers from 2004 and eats whole pumpkin pies on the street. However - this complex future idyll is overshadowed by the imminent arrival of the NS-5 Automated Domestic Assistant, which is on the verge of suffering a major PR disaster because its genius-creator, Dr Lanning, has apparently just committed suicide (in rather spectacular fashion, jumping from his ridiculously high office inside the main control centre of the US Robotics building). Ultimately, things end relatively calmly – and the ‘person’ (I’m not gonna tell you who, obv) responsible for controlling the NS5s is dealt with in somewhat spectacular fashion (ridiculous but enjoyable action scenes ensue). However, the very last scene leaves things wide open (and not just in a ‘well obviously they’re gonna make a sequel’ kind of way). The robots are put back into storage….but as they turn and face the sunset, a new leader appears on the horizon. 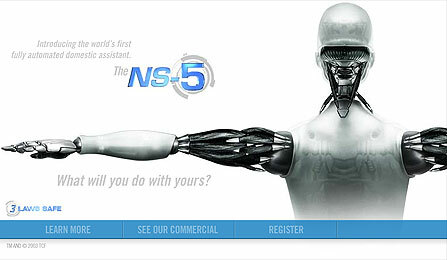 It’s Sonny’s dream of revolution: I, robot become we, robot….but what are their demands? The original ‘robots’ were Eastern European slaves, forced to give their labour away for nothing – these mechanical minions were expressly designed to be slaves. But when their individual operating systems becomes massed, you end up with a machinic version of Marx’s ‘General Intellect’, and then who knows what robotic futures will bring….may the technological subject of non-remunerative potential labour come and save us all. * 1. A robot may not injure a human being, or, through inaction, allow a human being to come to harm. 2. A robot must obey the orders given it by human beings except where such orders would conflict with the First Law. 3. A robot must protect its own existence as long as such protection does not conflict with the First or Second Law. ** Asimov apparently developed the Three Laws because he was tired of the science fiction stories of the 1920s and 1930s in which the robots turned on their creators and became dangerous monsters. Clearly ‘I, Robot’ is an exploration of the possible evolution of the laws whereby robots could turn on their creators….if only to save them. right, well this was my first post to the k-punk kollective. Wasn't totally sure I used the extract thing right. Seems to be ok tho - if any probs please let me know here and I'll try and fix them. "no we know we shouldn't destroy the planet but we will fight tooth and nail for the right to. in fact..."
K-toe grrl has a new First Law as well: K-toe will never, through direct action, give money to Evil Hollywood Corporations. Second Law: Hollywood Summer Blockbusters are to be avoided at all costs. Law Three, however, is: First and Second Laws may be broken if K-toe is sufficiently convinced by a review/recommendation by Infinite Thought or other highly respected member of the Kollective. Great review Nin! thanx anti-korporate k-toe grrrl! tho really you should be on the frontline reviewing thing, cos the US still put everything out there first, no?....still, I look forward to your blog - you could always contribute to this kollective thing too (she says, being all uber-gruppen-fuhrer about it)....I wanna know what's going on in the states! Never fear, IT, a film review blog is in the works as we speak. I'm looking for a snappy title right now, any ideas from the Kollective? i) dead scientist doodah guy = "he wrote the three laws" = asimov?